The Milander Quartet is a fairly new ensemble, and this is their début recording. Mind, you wouldn't know that to listen to it, the four players are clearly finely attuned to each other's artistic sensibilities, and the unity of intent here is astounding. The big name in the ensemble is pianist Milana Chernyavska. She is the driving force, it seems, but she's not one to hog the limelight, and the four players sound like equal partners, both in terms of their artistic input and their relative weight in the recorded sound. That kind of democracy is what really makes chamber music come alive, but it is all too rare on record, especially with piano trios, quartets and quintets, where the pianist's ego almost always sees them pushed to the front of the sound stage. 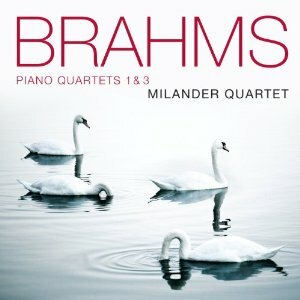 Brahms' Piano Quartets are filled with music of extremes, but players don't do it any favours by playing it at face value. Fortunately, then, the Milanders often take Brahms' tempo and dynamic indications with a pinch of salt. The opening movement of the First Quartet, for example, is marked Allegro, but the notes themselves don't really bear that out. So the performance here errs toward slower tempos, but retains enough flexibility to build up some real intensity in the climaxes. And when Brahms writes 'pp' or 'ff', as he does far more often than he ought, the players have the sensibility to express these extremes through timbre and texture rather than relying on sheer volume. Of course, there are times when only excess will do – I'm thinking in particular of the Gypsy dance that closes the First Quartet and the tempestuous development of the Third Quartet first movement – but the fact that the players save those extremes for when they are really needed gives them all the more effect. Despite the rigorous control exercised throughout, this doesn't come across as an overly controlled performance. In fact, the ensemble in the strings is occasionally slightly loose, as if the players are emphasising passion over precision. It's not a big problem the ensemble, and they are the same problems as you'll find on any recording; Brahms is asking for it really, writing long, loud passages with the violin and viola in octaves for example. When the players perform as soloists, all thoughts of imprecision evaporate. The cellist, Beni Santora, makes a fabulous job of the solos in the first movement of the First Quartet, and the quality of viola playing from Alexander Moshnenko is the equal of the violin playing from Lisa Schatzman. That is another unusual quality from a piano quartet, and it is a real asset here because Brahms treats the two as equals. The sound quality is excellent, and (as mentioned above) the balance between the players is exceptional. The sound of the piano is just wonderful, its a Steinway D and the sound of its bass strings is rich, focussed and very satisfying. All round, this is an impressive reading of two of Brahms' greatest chamber works. According to Avie, it is the first of a pair covering the Brahms Piano Quartets. If the Second Quartet is played and recorded to this standard, it will definitely be worth hearing. That leaves the question of what the coupling will be on volume 2, and my money is on the Piano Quintet. Those two works are already overexposed on CD, in a way that the First and Third Quartets are not, so the Milanders were probably wise to start here. A great recording and a very promising start to what should be a glittering recording career for the ensemble.